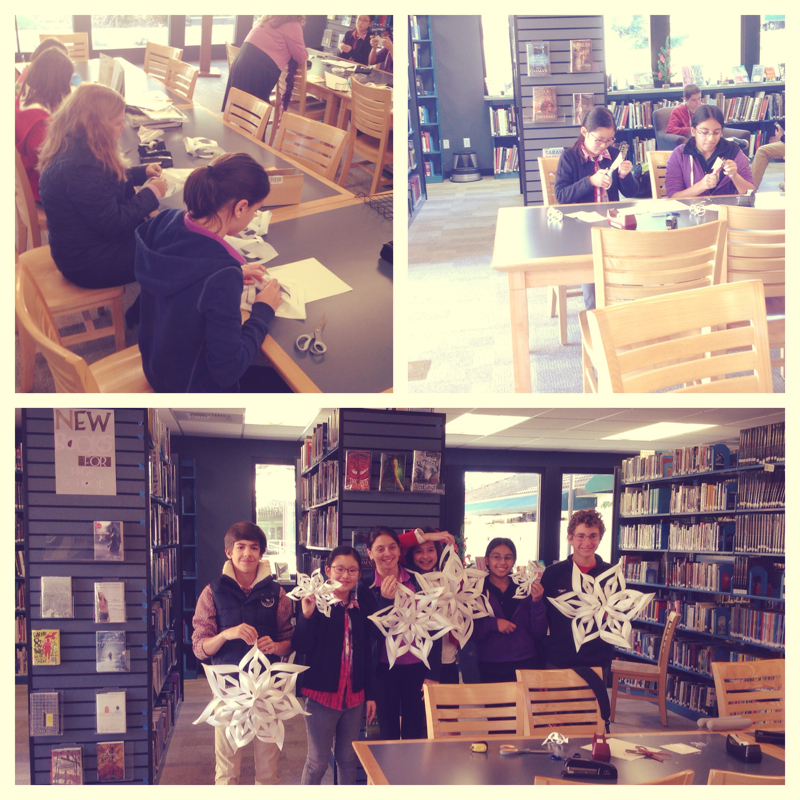 Today we had Ms. LaComb’s advisory in the library for a 3-Dimensional snowflake workshop. Ms. Melinson showed everyone how to cut, tape, and staple their way to creating a winter wonderland. To make your own 3D snowflake, a video tutorial can be found here. If you prefer a picture tutorial with with written instructions, that can be found here. For our December Leadership Lunch Series, we had Melissa V. give a speech about her summer spent working in a lab at UC Davis. The project researched Multiple Sclerosis. Melissa gave us the background of the disease and told us about the progress the lab was making toward finding a potential cure. Melissa spent over 100 hours in the lab over the summer, where her duties included making microscopic slides, backing up photos, and reorganizing a massive refrigerator full of specimen slides. 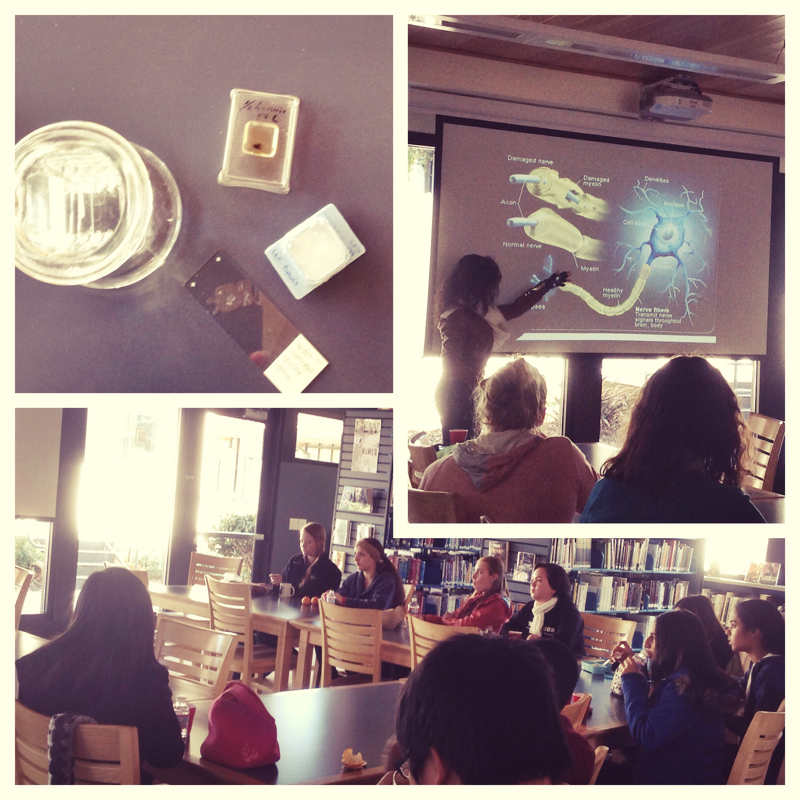 She even brought a few samples of slides for everyone to see. Emma W., our devoted Leadership Lunch Series Coordinator, once again supplied fantastic snacks and beverages, including Cheetos Mix-Ups. You rock, Emma! Today we had our 13th Annual Glass Knife Latke Throwdown. What is a Latke Throwdown, you ask? Well, the story goes like this: a few years ago, a couple of students were arguing in the library about whose mom made the best latkes. The argument was getting heated. The solution was a simple one: bring in the latkes, and let everyone on The Glass Knife staff be the judge. That first year focused on traditional Jewish foods. In subsequent years, the party was expanded to include a variety of traditional foods from students’ families and cultures. 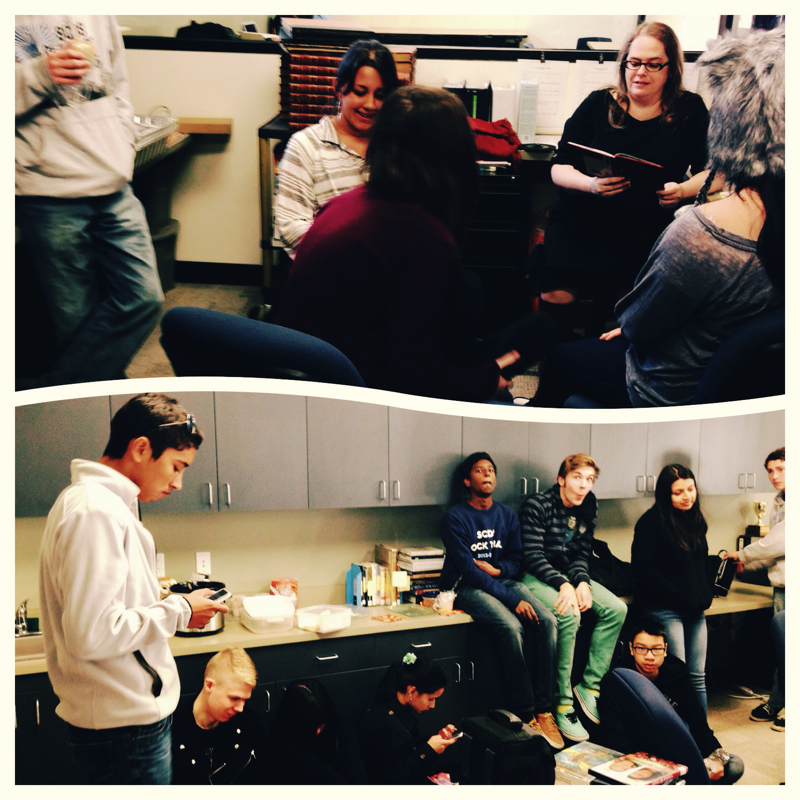 Every year, Ms. Melinson reads The Latke Who Couldn’t Stop Screaming. We didn’t have latkes this year, but we did have hot water cornbread, arroz con leche, matzo ball soup, a variety of Christmas cookies, and hot apple cider. It was delicious fun!